Water conservation measures formed part of the dairy development on this 135 cow farm. This resource efficiency investment was supported under the Rainwater Harvesting Scheme, with collected water used to wash dairy facilities. Water has been underappreciated in Ireland, primarily due to a temperate climate with relatively high levels of rainfall. However, climate change, altering demographics and occasional water restrictions in urban areas have brought new perspectives on the importance of water conservation. Farming places a high demand on water and with agricultural output targeted to increase considerably by 2020, the demand is likely to increase. The Rainwater Harvesting Scheme was introduced in 2011. The objective of the scheme is to conserve water by maximising the use of rainfall run-off and reduce water costs on farm. This is achieved by grant aiding support for rainwater harvesting facilities and equipment. The scheme is targeted at dairy farmers. The rainwater harvesting facilities and equipment are grant-aided at 40% up to a maximum grant level. This young farmer runs an 86 hectare dairy farm. Annual milk production is 800 000 litres from 135 cows, and he plans to expand post 2015. A new 24 unit milking parlour was erected in 2012, making the available water supply insufficient. A new system of water storage was installed on the farm and all rainwater is now stored in a 130 000 litre tank and about 5 000 litres is used every day to wash the facilities. All the water used for plate cooling of milk is now being captured. While the initial cost of the system is quite high (€16 000), the farmer now has an excellent environmentally sound reservoir system to cope with expansion. Alternative water purchase would be about €1 500 per year. The new milking parlour has improved the environmental impact of the farmyard as all rainwater is now collected instead of diversion to a river. This improves flood prevention downstream during high rainfall. Overflow from the rainwater storage tanks goes into a soak-away. Milk production in Ireland will increase by 50% from 2015 to 2020. With about seven litres of pumped water used for every one litre of milk produced, the stress on water supply is obvious. Rainwater harvesting can provide an average of 30% of the water requirement on a typical Irish dairy farm. But many farmers are unaware of water conservation and of the financial and environmental benefits. 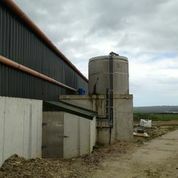 This examples shows that rainwater conservation can be effectively incorporated into Irish farmyards.